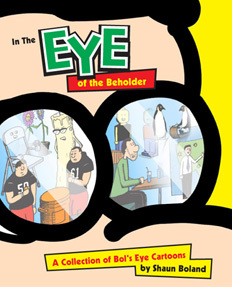 Shaun Boland will be appearing at the Toonseum in downtown Pittsburgh on Saturday, December 14th from 1 p.m. to 4 p.m. to sign copies of his humorous, family-friendly book titled, In the Eye of the Beholder: A Collection of Bol’s Eye Cartoons. Boland is selling the book for $15 and donating 50 percent of his 2013 book profits to Children’s Hospital of Pittsburgh. Cartoonist Shaun Boland has announced that he will be donating 50 percent of his 2013 book profits to Children’s Hospital of Pittsburgh. Boland’s book, In the Eye of the Beholder: A Collection of Bol’s Eye Cartoons, is a gallery of off-beat, family-friendly cartoons. He is selling the book for $14.95. Boland’s humorous illustrations have appeared in over 40 publications in 10 states across the United States. To bring further awareness to his fund-raising effort, Boland will be appearing at the Steel City Con (AKA: The Pittsburgh Toy, Comic and Collectibles Show) in Monroeville, PA, from December 6-8. To purchase a book and contribute to this cause, visit www.bolseye.com/book. The July 2011 issue of Johnstown Magazine features a very nice review of the Bol's Eye gallery book. Check out the Bol's Eye story appearing in The Mainliner newspaper. 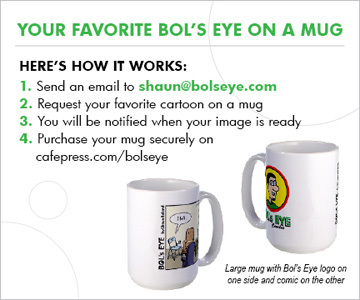 Did you know that you can get Bol's Eye by Email for free? Simply click the link on the left side of the page to receive weekly cartoons and the latest news, including Bol's Eye merchandise giveaways. Your Email will be kept confidential and will not be shared with any other parties. You can unsubscribe at any time. Get your Bol's Eye Christmas Cards today! Take a look INSIDE the new Bol's Eye book! You can flip through pages, leave comments and rate the book. To see at maximum size, click the "Fullscreen" button on the top left. The wait is over. The first-ever Bol’s Eye gallery book is HERE! Bol's Eye Featured In Unplugged The Book! Bol's Eye can be seen in Unplugged, the latest book by author Ryan G. Van Cleave, Ph.D. Bol's Eye video game-themed cartoons are featured in the book along with an interview with the artist. Unplugged is available in select bookstores and Amazon.com.